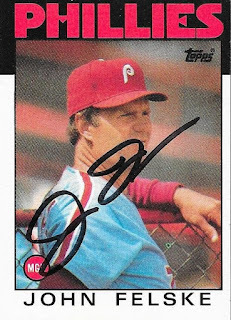 My quest for 1987 Topps signatures has already landed me some big names, and this success from former manager, Jim Leyland, is a really nice success. 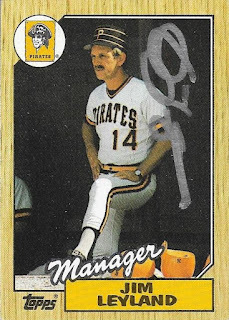 Leyland signed the card in silver Sharpie, since the background was so dark. Leyland (b. 1944) managed in the majors from 1986 to 1999 and 2006 to 2013 for the Pirates, Marlins, Rockies and Tigers. His career record is 1,769-1,728 (.506 winning %). He won the NL Pennant in 1997 with the Marlins, and went on to win the World Series that season. He also won the AL Pennant in 2006 and 2012 with the Tigers. He was the NL Manager of the Year in 1990 and 1992 and the AL Manager of the Year in 2006. 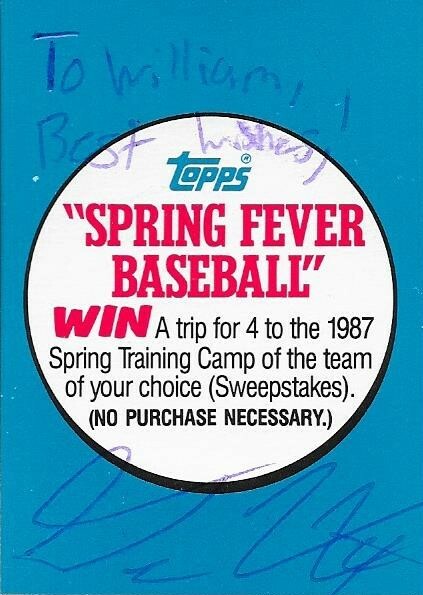 I mailed to Leyland on January 20 and got the card back on February 3, for a 14-day TAT. Here is a small break from the onslaught of 1987 Topps TTMs that I have gotten. 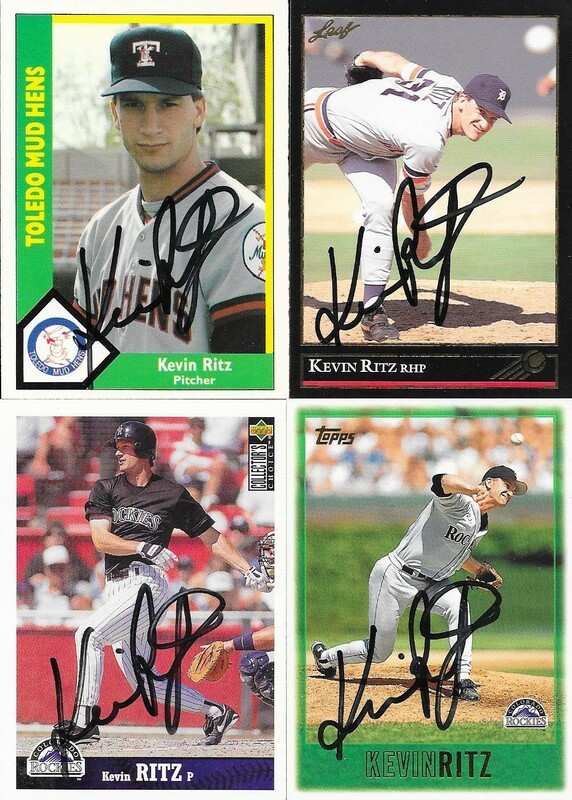 This success from Kevin Ritz featured some nice 90s cards, especially the above 1997 Fleer Metal. The card turned out great. I didn't prep it at all, and the Sharpie didn't smear or bubble any. It really turned out great. The card on the top left was one of the 1990 CMC AAA cards that came out of Mom's attic box, and the card on the bottom right is a rare appearance of a 1997 Topps in my album. I'm glad I was able to add that one. I am debating as to whether or not I want to pick up a box of 1996 or 1997 Topps to add to my hoard of Topps products, but with my 1987 project, I am not pressing too hard with that. It is something I might do, if I come into some money sometime soon. Ritz (b. 1965) played in the majors from 1989 to 1992 and 1994 to 1998 for the Tigers and Rockies. He had a career record of 45-56 with 462 strike outs and a 5.35 ERA. 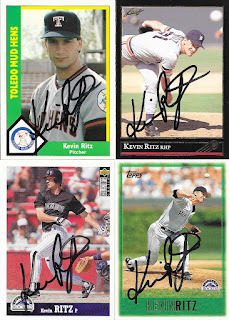 I mailed to Ritz on August 7 and got the cards back on February 2, for a 179-day TAT. 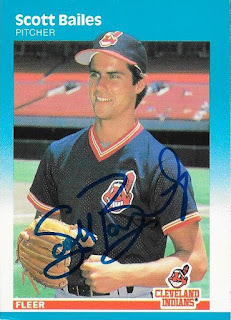 My quest for signed 1987 Topps has led me back to a few players who I got TTM years ago when I was sending out baseballs. One of those players is Andre Dawson. Knowing what I know now, I probably should have done cards all along. It is so much cheaper to send a few cards than it is to send baseballs. Add in the fact that back then, I was sending out the cheap Target balls, and a good many of them have failed to hold autographs over the last eight years. Oh well, you live and learn. Dawson charges $10/card, so I sent a check for $40 and these 4 cards. I was almost set at three, but I liked the 1996 Pinnacle Zenith (top of page) so much, I added it in. I started off with the 1987 Topps, but I wanted to get a 96 in the album, since I have very few of those. I also loved the Expos uniform and hat on the 1981, so that one had to be sent out as well. In the end, I think I did well. Dawson (b. 1954) played in the majors from 1976 to 1996 for the Expos, Cubs, Red Sox and Marlins. He had 2,774 hits, 438 home runs and a .279 batting average. He was the 1977 NL Rookie of the Year and the 1989 NL MVP. He was an 8-time Gold Glove Award winner (1980-1985, 1987 and 1988) and an 8-time All Star (1981-1983 and 1987-1991). He was elected to the Hall of Fame in 2010 (his 9th ballot) when he received 77.9% of the vote. I mailed to Dawson on January 2 and got the cards back on February 2, for a 31-day TAT. 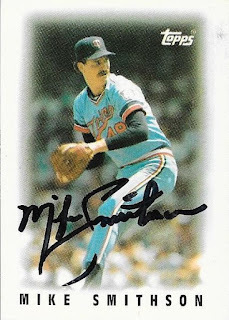 Another name off of the list from the 1987 Topps set occurred recently with this success from Mike Smithson. I had a few of his cards that I could send. This 1986 Topps Team Leaders mini was one I was really happy to see come back. 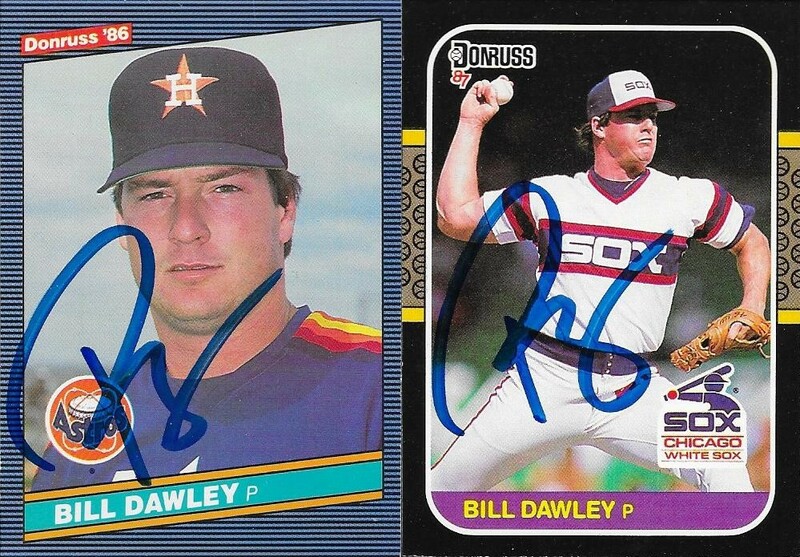 I also got these Topps cards signed, a 1984, 1985 and obviously a 1987. I've added a bunch of 87s to the set recently, and hope some of the coach and manager cards I sent to Spring Training start coming in, so I can add a few more. Smithson (b. 1955) played in the majors from 1982 to 1989 for the Rangers, Twins and Red Sox. 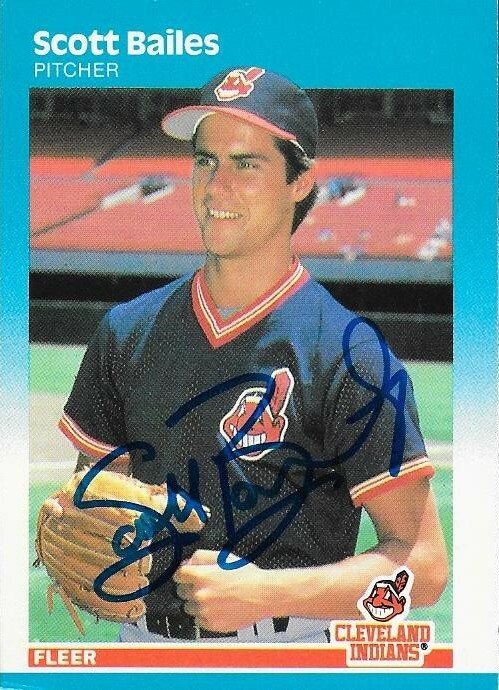 He had a career record of 76-86 with 731 strike outs and a 4.58 ERA. He did not appear in the post season in 1987 when the Twins won the World Series. I mailed to Smithson on January 22 and got the cards back on February 1, for a 10-day TAT. My good friend, Gerard, recently went to Red Sox Fest, or whatever it is called. I get all of the names mixed up. Anyway, he hooked me up with a bunch of autos while he was there. 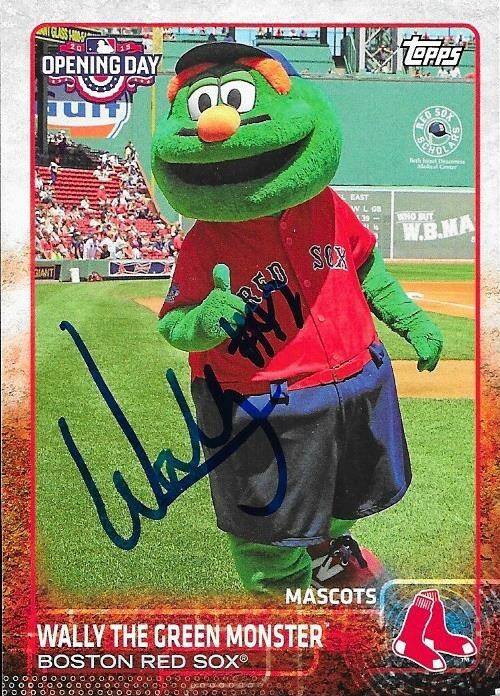 I wasn't expecting this 2015 Topps Opening Day mascot card back signed, but Gerard got it done. Now, I have a mascot in my binder. 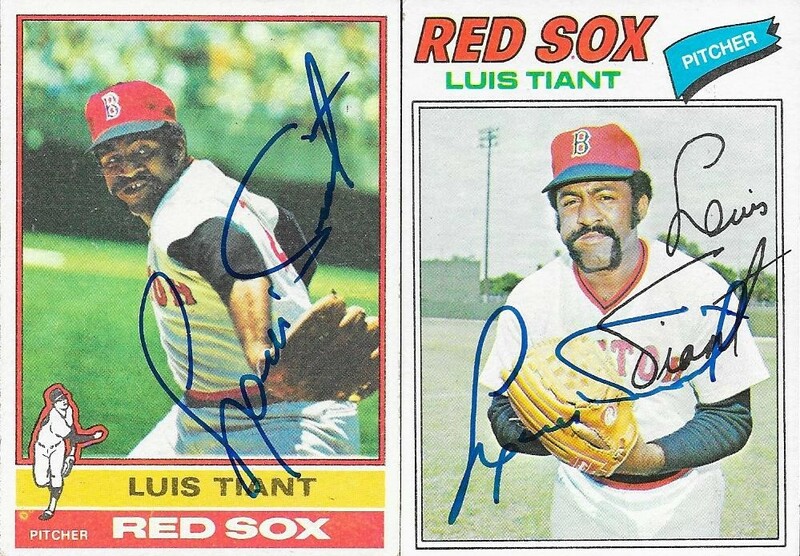 Gerard was able to get two cards signed for me from the legendary Luis Tiant. I have Tiant on a ball, but needed a couple cards for the albu,. I think they both look great. Here are a couple of the other cards that Gerard got me. I think I provided the Marrero, but I don't remember if I sent him the other two or not. Still, I like them. I'm not sure what Vazquez signed his card with, it looks like a paint pen. Finally, I have a huge stack of these Topps Spring Fever Baseball entry cards for some reason. Instead of recycling them, I figured I would send some out to my graphing friends who do Spring Training, and Gerard was the first one to send one back. These will go in my album just like any other signed card. I feel like it is a nice way to commemorate some of my friends who contribute to my album. Thanks for the autos, Gerard! Have fun at Spring Training. Here is another player among the long list of players that I pulled while trying to add to my 1987 Topps set. I had quite a few of his cards, and they all look really nice. Not often mentioned is a box of mid-80s Donruss and Fleer that I have. I try to add some of them to my TTM requests from time to time, so my returns aren't always so loaded with Topps stuff. The above 1987 Fleer is a nice card. I like the blue background. I've got a few other TTM requests outstanding that came from that box, so there should be a few others coming in here and there. I did have some Topps cards in the request, though. Obviously, I sent the '87. I also added a 1990 and a 1992. The borders of 1990 always are fun, and the photos in 1992 are nice. 1992 didn't have photography that matched 1991, but it was still a decent set. Bailes (b. 1961) played in the majors from 1986 to 1992 and 1997 to 1998 for the Indians, Angels and Rangers. He had a career record of 39-44 with 351 strike outs and a 4.95 ERA. I mailed to Bailes on January 20 and got the cards back on February 1, for a 12-day TAT. 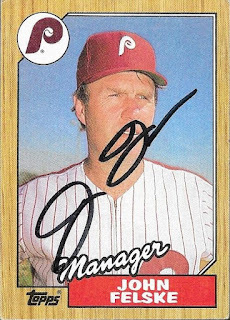 I knocked another 1987 Topps off of the list with this TTM success from former Phillies manager, John Felske. 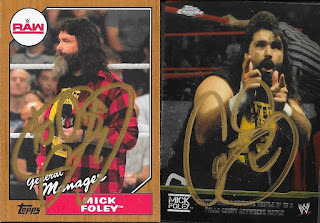 I got two cards signed by him, and am pretty sure (without looking it up) that these were his only two cards. Felske (b. 1942) played in the majors in 1968, 1972 and 1973 for the Cubs and Brewers. He had 14 hits, 1 home run and a .135 batting average. 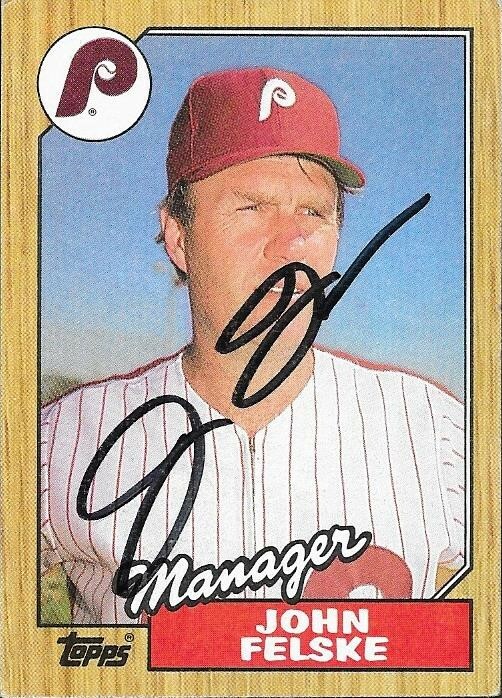 He managed the Phillies from 1985 to 1987 to a record of 190-194. He had a winning season with the Phillies in 1986 when they went 86-75 and finished 2nd in the NL East, 21.5 games behind the eventual World Series Champion Mets. I mailed to Felske on January 22 and got the cards back on February 1, for a 10-day TAT. Here is a TTM success of a more recent player, Chris Coste. I needed more 2009 Topps in my album, so it was easy picking which cards of his to send. I'm just glad I had his '09. I was also able to get this nice 2009 Upper Deck signed, and it turned out nicely. Coste (b. 1973) played in the majors from 2006 to 2009 for the Phillies and Astros. He had 219 hits, 23 home runs and a .272 batting average. 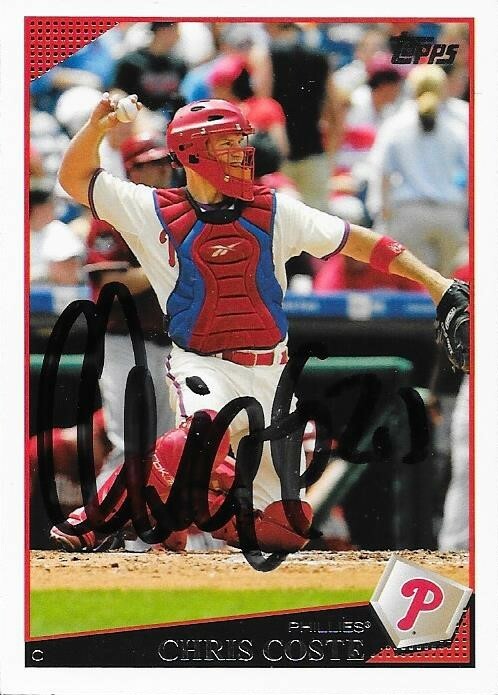 He won the World Series in 2008 with the Phillies. I mailed to Coste on January 22 and got the cards back February 1, for a 10-day TAT. 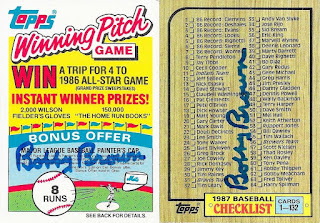 I wanted to get Bobby Brown on a checklist for my 1987 Topps set, since he was the AL President when the set was released. I had this old Fleer Yankees sticker that was in one of my boxes, so I sent it along as well. This sticker is from 1985, I believe, and looks kind of cool with Brown's signature. 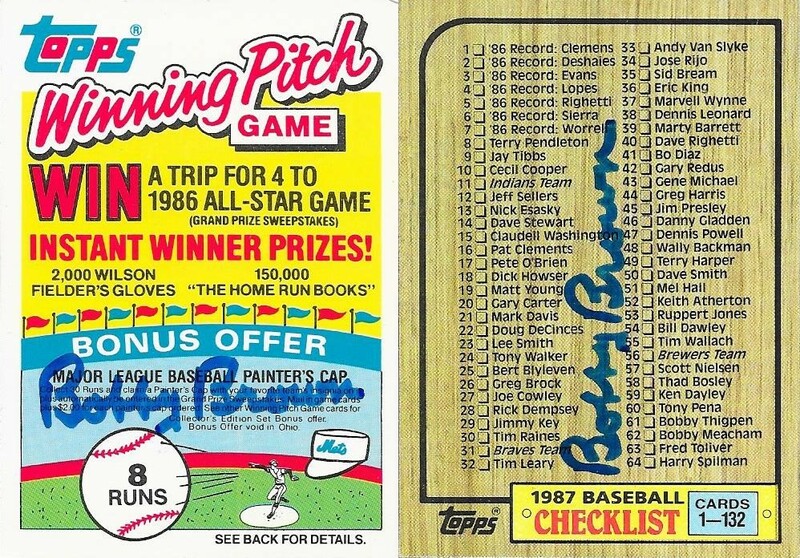 Along with the checklist, shown above, I got the Topps Winning Pitch Game for the 1986 All Star Game signed. One of the boxes from Mom had a decent-sized stack of those cards in it, so I figures it would be cool to get one of them signed and into my album. I mailed these cards off to Brown on January 22 and got the cards back on January 31, for a 9-day TAT. The bucket list took a big hit this past weekend. I was finally able to meet some of the actors who starred in my favorite movie of all time, Aliens. 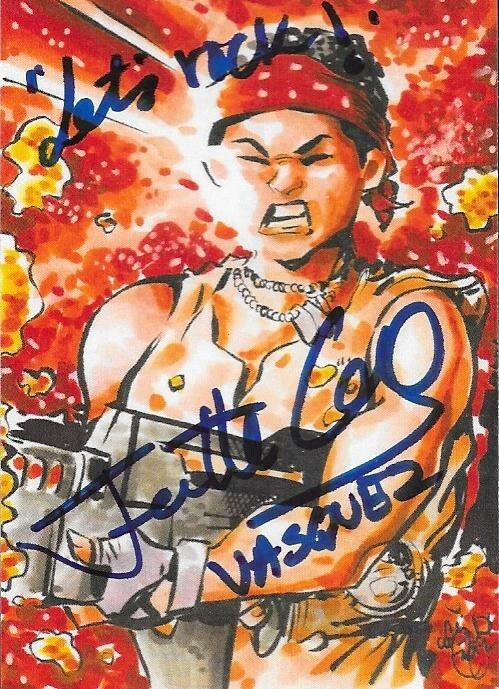 I had gotten an autograph TTM from Jenette Goldstein (the actress who played Vasquez) a while back, but thi time, I had the opportunity to meet her. 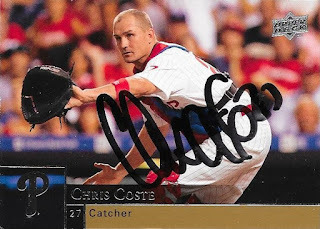 She signed this custom card for my son, Chris, and remembered that I had sent one to her TTM. She also is helping me get the other one I had made for the Drake character signed. She still is in contact with Mark Rolston and took one of the cards I had and is going to try to get him to sign it. 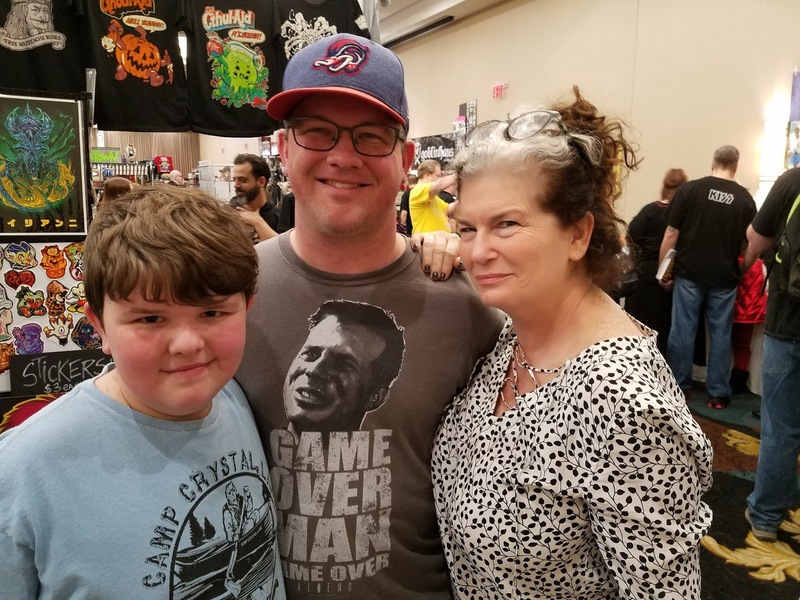 Jenette also commented on my shirt, and we spoke briefly about the loss of Bill Paxton. She was so friendly and down-to-earth, which made me less nervouse than I was at the outset. She spoke with me like we had been friends forever, and that really meant a lot to me. This was such a huge moment for me. We, then, went to the next table and met Aliens and Terminator actor, Lance Henriksen. He, too, was super friendly, and spoke with us for a bit. 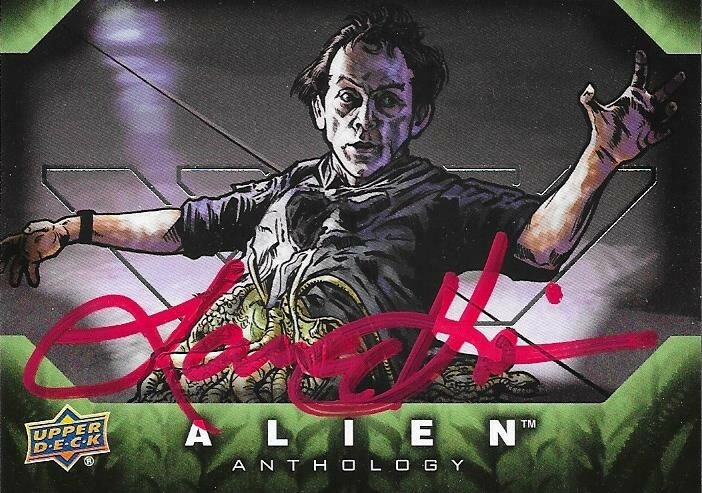 I had purchased a few cards from the Alien Anthology set to have Henriksen sign. I settled on this card once I saw his fee ($60). Luckily, Henriksen was really nice to Chris and told him that there was no way he was going to charge Chris $60 for an autograph, so he let him have this 8x10 and signed it for him. He also inscribed it "Not bad for a human", which was really awesome. 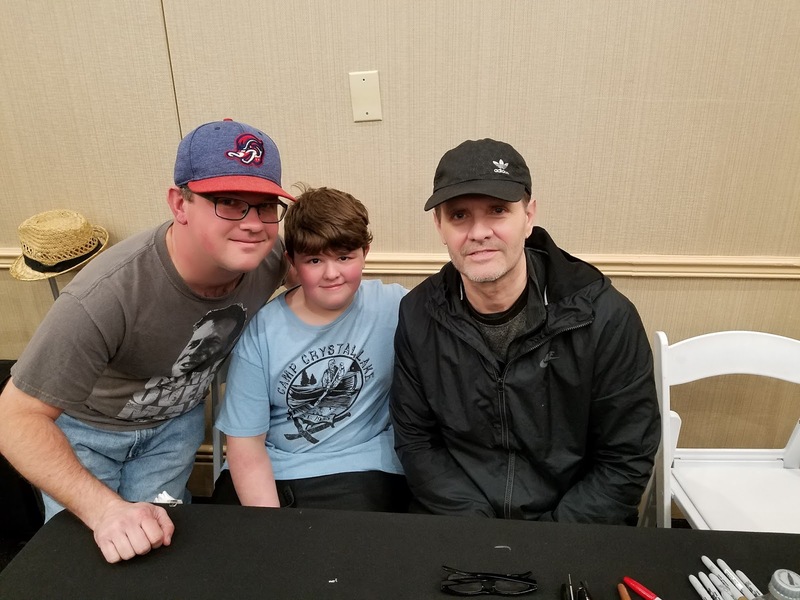 Then, we met Aliens, and Terminator actor, Michael Biehn. I got a card signed by him, and clarified the pronunciation of his last name (bean). He was friendly, but didn't say a whole lot. When I went back to have him sign a photo that I picked up, I made him laugh. I told him that my dad was a huge Tombstone fan, and that my dad took us to see it 5 times in theaters. I said "So, I think I bought your dinner a few times." This caused him to look up and laugh. 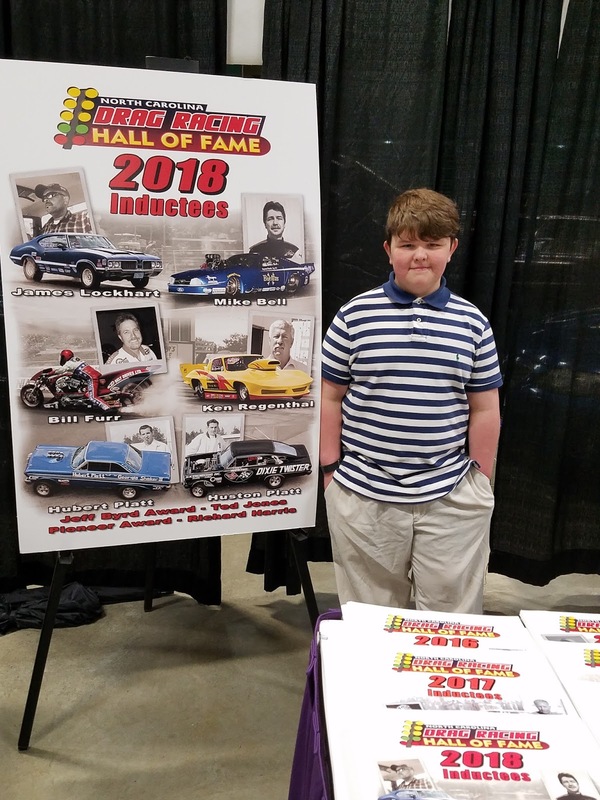 We, then, talked about racing, since I told him how proud I was about my dad being inducted into the Hall of Fame the day prior. He thought it was really cool. 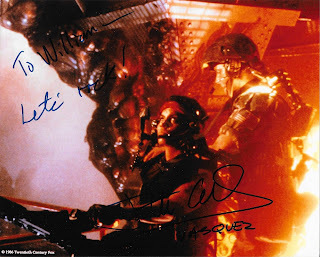 Biehn was a really cool guy. After meeting Michael Biehn, I met up with my friend, Nathan, and walked around the show for a bit. 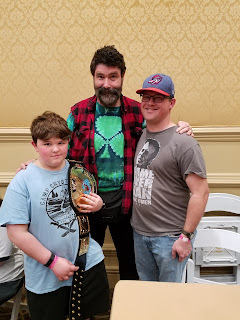 I had planned on meeting WWE legend, Mick Foley, but we couldn't find him. I was about to leave the event, content to save the rest of my money, but we were able to find him. 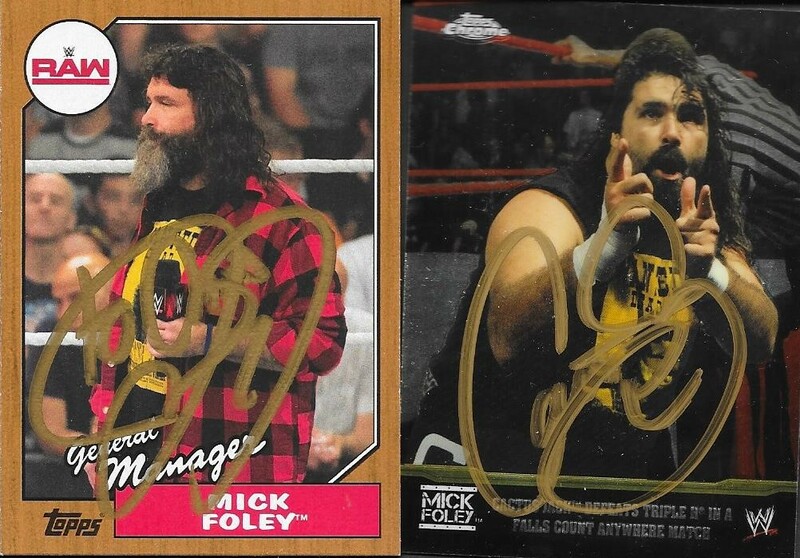 I had bought some of his cards as well for Chris and I. I'm a huge Cactus Jack fan, so I had to make sure the card I had was of Cactus. He, like Henriksen, told Chris that he didn't want to charge him to sign a card, so he let Chris pick out a photo. I don't know if I could be any prouder of my son for picking this photo of Foley from his Japanese Death Match. 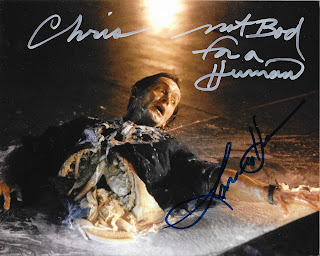 Yeah, it's gory, but it is a legendary shot, and Chris picked it out. It turned out great with the gold Sharpie. 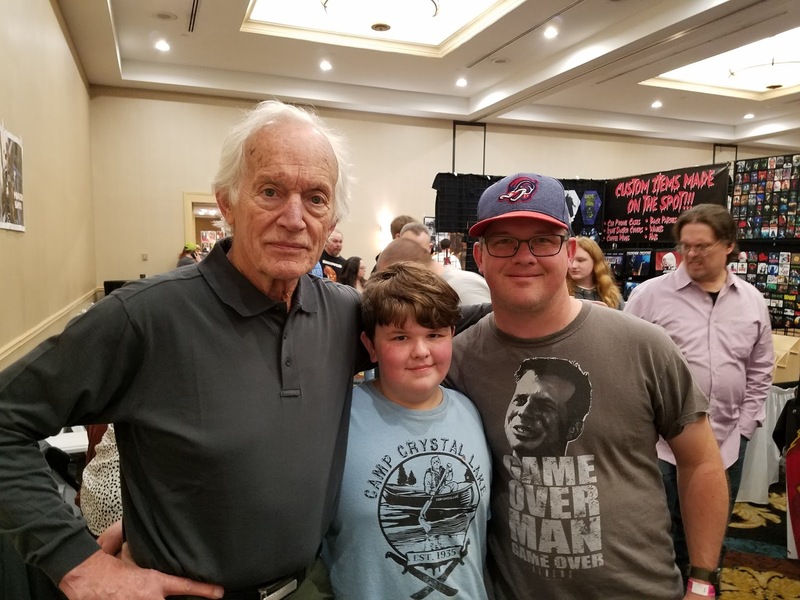 I had an amazing time at the Mad Monster Party, and plan to attend if they come back to Charlotte. The lines were short for all of the actors (and wrestler) that I wanted to meet. The prices for autos are set by the artists, and they were in line with what I spent at the Walker Stalker last year. I can't put into words how excited I was to meet these guys, especially Goldstein. The photos Chris and I got signed are already framed and ready to be put on our walls. 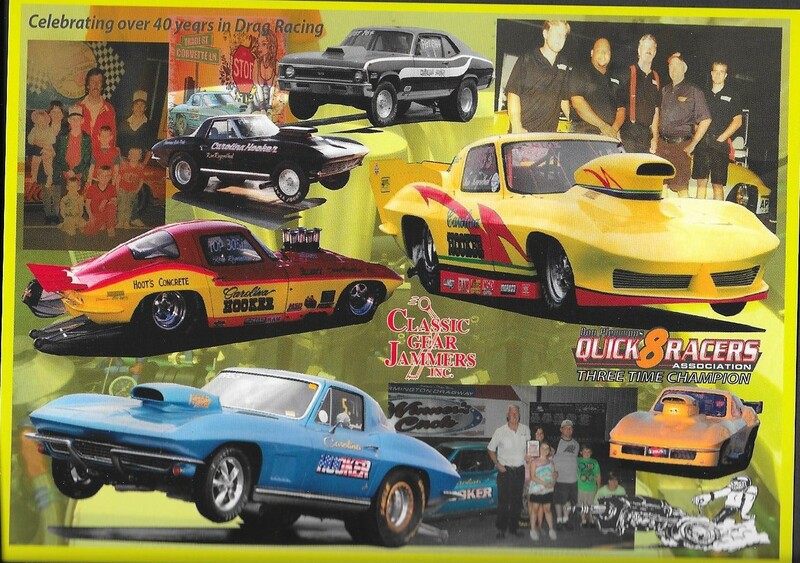 After 40+ years of drag racing, my dad was inducted in the North Carolina Drag Racing Hall of Fame this past Saturday. 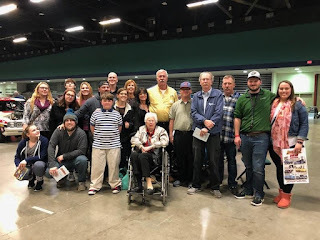 I attended the ceremony and car show at the Greensboro Coliseum with most of my family. It was a lot of fun, and it was really cool seeing Dad get some recognition. 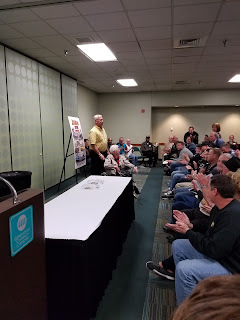 In his career, he has never had the photo handouts that a lot of racers have at events. Finally, some were made, and they turned out really great. The front of the handout is at the top of the page. Of course, I had Dad sign some of them, so I could hand them out to some of my trading partners. The back of the card is the collage of photos shown above. I'm actually on the card twice, which is really cool. I think Mark Joyce of MJ Printing & Graphics did a great job on this. He had designed Dad's t-shirts for years. 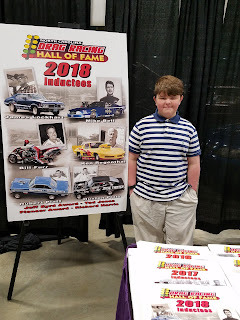 Here is my son, Chris, standing in front of the poster honoring this year's inductees. All of the copies of this poster had sold out by the conclusion of the event. I got a couple of them signed by this year's inductees, and the other former inductees who were in attendance. It was a little weird being someone who pursues autographs watching people "graph" my dad. He enjoyed it, and had quite a few people come up and ask for his autograph. Dad had to give a speech accepting the induction, and at the conclusion, the folks there had all of our family stand (because our family is so huge). They also had Dad bring my grandmother to the front of the room, which was a really cool moment. 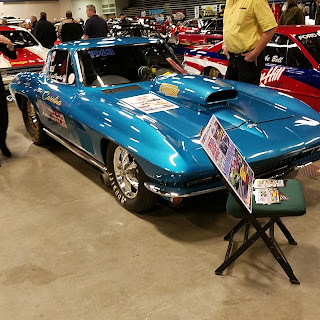 Part of the deal was a car show, and Dad had his car on display. I really enjoyed looking at some of the old race cars, and talking to some of the drivers. In attendance was former multi-time NHRA Pro Stock World Champion, Warren Johnson, whom I was able to speak with for a few minutes. 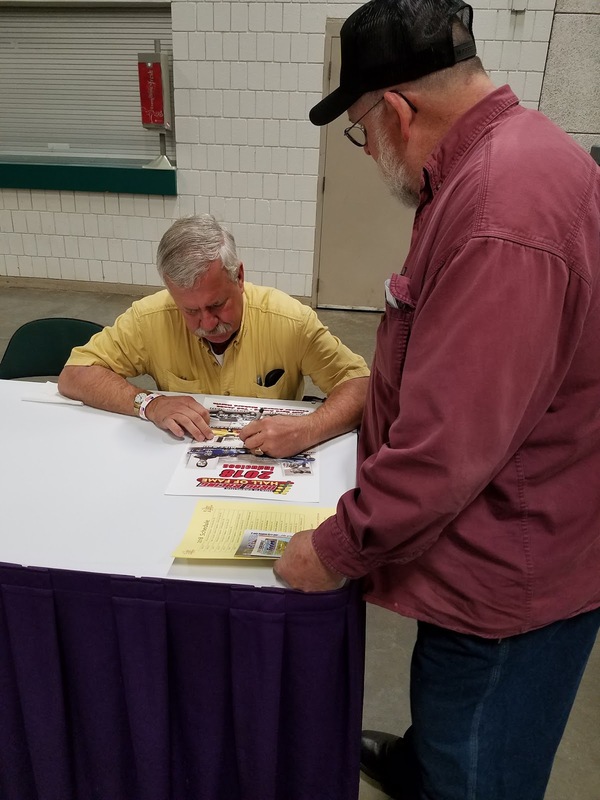 I also enjoyed a long conversation with former Pro Stock racer, Jerry Eckman. Most of the family was able to attend, which turned it into a bit of a family reunion. My wife was unable to attend, as she had to work. I recorded Dad's induction speech so she would be able to see it. Here is the YouTube video of Dad's speech. I helped him prepare for it a bit, and he did really well. I hope he was able to tell how proud I am that he received this honor. 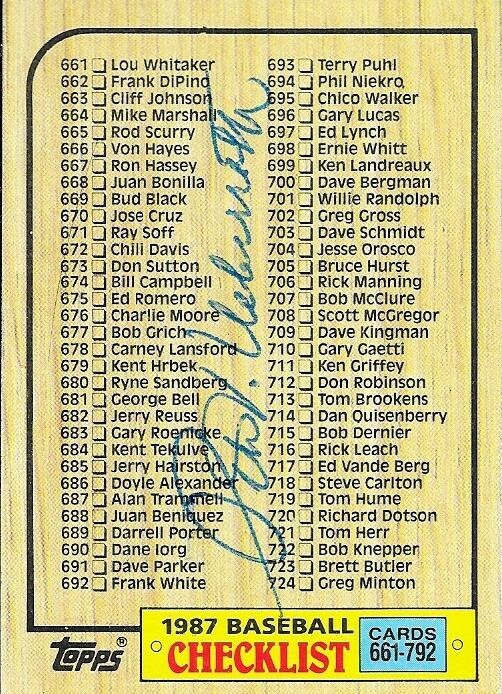 I stole an idea from a fellow autograph set builder in what exactly do I want to do with the checklists from 1987 Topps. There are 6 checklists in the set and I had 51 checklists in total in my 1987 Topps box. I don't like throwing anything away, so I figured I would get some signed for personal reasons and a few signed for the set. 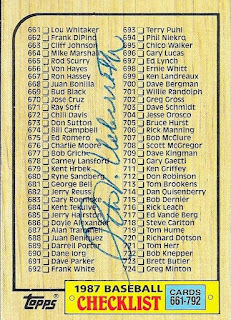 One of the ones I had done for the set is this one that I got back from the commissioner at the time, Peter Ueberroth. I figured it would make sense to include this one in the actual set that I am working on, because of his being the commissioner. Ueberroth (b. 1937) was the MLB commissioner from 1984 to 1989. He was responsible for persuading the Cubs to install lights at Wrigley Field and initiated MLB's investigation into Pete Rose and gambling. He was also the commissioner in charge when the MLB owners were found guilty of collusion in suppressing player contracts. Many blame the 1994-1995 players' strike on this. 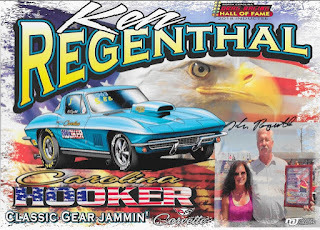 I mailed to Ueberroth on January 22 and got the card back on January 31, for a 9-day TAT. 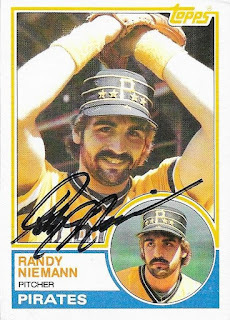 It took me two shots, but I was able to get a TTM success from Randy Niemann. This 1983 Topps is really cool, with the pillbox cap of the Pirates. I like the old Pirate uniforms, and this is a great example of them. I also got Niemann on an 80 Topps in an awesome Astros uniform. 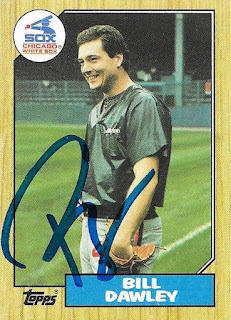 He is also in the 1987 set, so this was another card to knock off of the list. Niemann (b. 1955) played in the majors from 1979, 1980 and 1982 to 1987 for the Astros, Pirates, White Sox, Mets and Twins. He had a career record of 7-8 with 102 strike outs and an ERA of 4.64. I mailed to Niemann on January 8 and got the cards back on January 31, for a 23-day TAT. I've been getting some bigger names in through TTMs lately, mainly as I keep trying to add to my 1987 set. 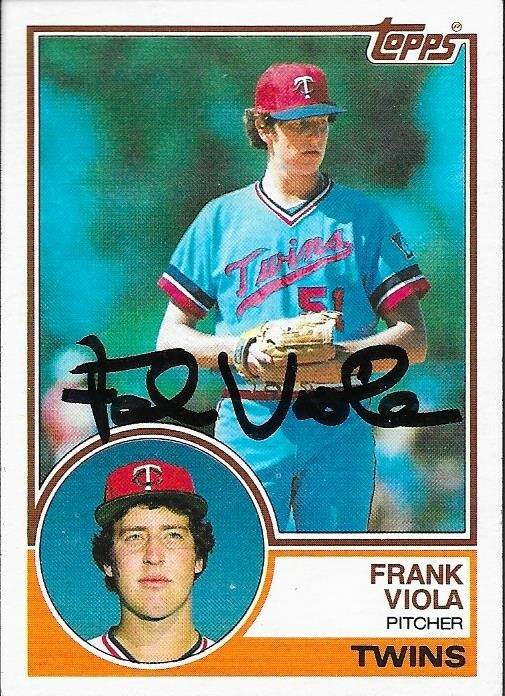 This time around, I received a success from Frank Viola. One of the cards I got back was this nice 1983 Topps rookie card. I had forgotten that I had his rookie in my 83 box, but found it and sent it along. This 1984 Topps also looks nice. I almost passed on sending this one, but figured, why not, so I sent it. 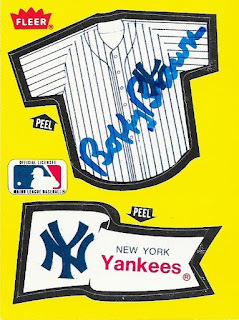 This was a great TTM success, as it knocked off three cards from the 1987 set. 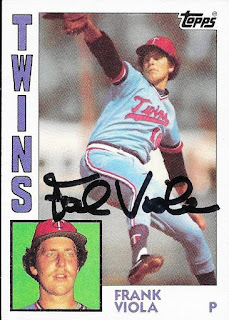 I am working on some ideas for the 1987 checklists, but at the moment, I have been sending them to some TTM guys, and I figured that Viola would be good one one of them. 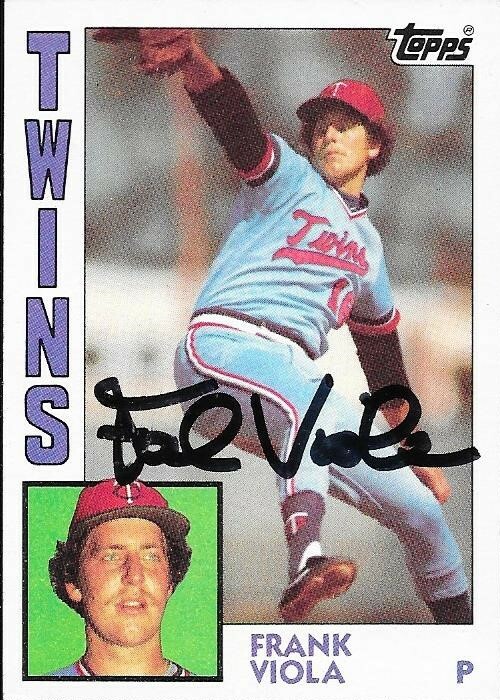 Since he is pictured on the 1987 Twins Leaders card, I was able to knock that one out as well. Viola (b. 1960) played in the majors from 1982 to 1996 for the Twins, Mets, Red Sox, Reds and Blue Jays. He had a career record of 176-150 with 1,844 strike outs and an ERA of 3.73. He was the 1988 AL Cy Young Award winner when he went 24-7 with a 2.64 ERA and had 193 strike outs. He finished 10th in the AL MVP voting that season. He also won 20 games for the Mets in 1990 when he went 20-12 and finished 3rd in the NL Cy Young voting. He was an All Star three times (1988, 1990 and 1991) and won the World Series with the Twins in 1987. He was the World Series MVP that year when he went 2-1 with a 3.72 ERA and had 16 strike outs. He appeared on the 2002 Hall of Fame ballot, but only received 0.4% of the vote. I mailed to Viola on January 22 and got the cards back on January 31, for a 9-day TAT. I paid his fee of $5/card. My TTM stack is getting bigger, and I am way behind on posting again, but that is a good problem to have. I've sent out a ton of TTMs lately, and have gotten some really good ones back. I've also gotten some back from some players who may not be household names. This success from Bill Bene is one of those examples. 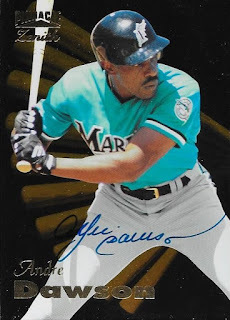 I liked how this 1989 Topps looked, and it turned out really nicely with his signature. Bene (b. 1967) was drafted in the first round (5th overall) by the Dodgers in the 1988 amateur draft out of Cal State LA. 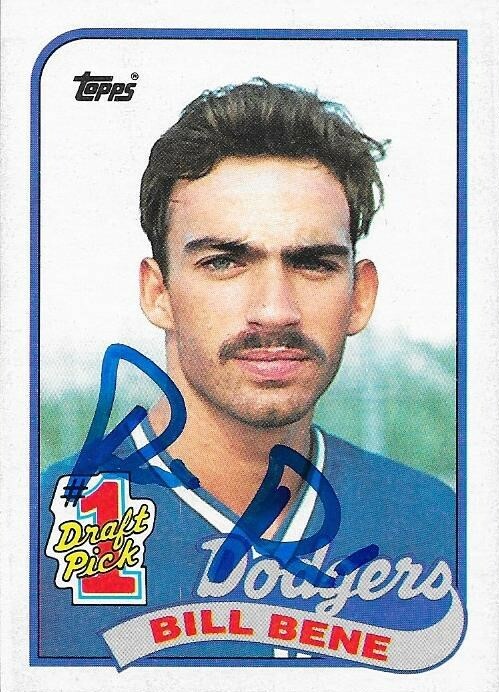 He never made the majors, but played in the minors from 1988 to 1995 and 1997 in the Dodgers, Reds and Angels systems. He did get as far as AAA. 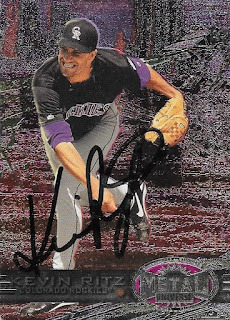 Across 9 minor league and independent league seasons, he had a career record of 18-34 with 502 strike outs and a 5.45 ERA. I mailed to Bene on January 16 and got the card back on January 30, for a 14-day TAT. 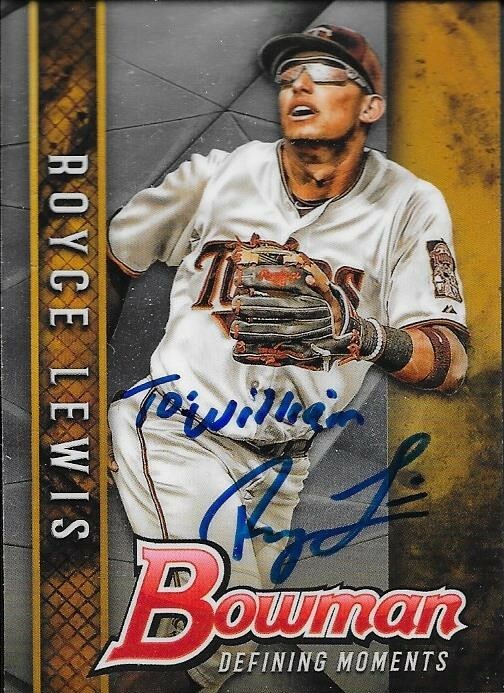 I added a few signed cards from 2017 Bowman Draft with this TTM success from Royce Lewis. I was really excited to get the above Bowman Defining Moments card back from him, as it turned out really great. He personalized each of the cards, but that was fine with me. I was able to add a Bowman Chrome and Bowman paper to the album. Lewis (b. 1999) was drafted #1 overall last year in the Amateur Draft by the Twins out of a California high school. He played at two levels in the Twins' system (rookie level and single A) last season. He had 57 hits, 4 home runs and a .279 batting average. 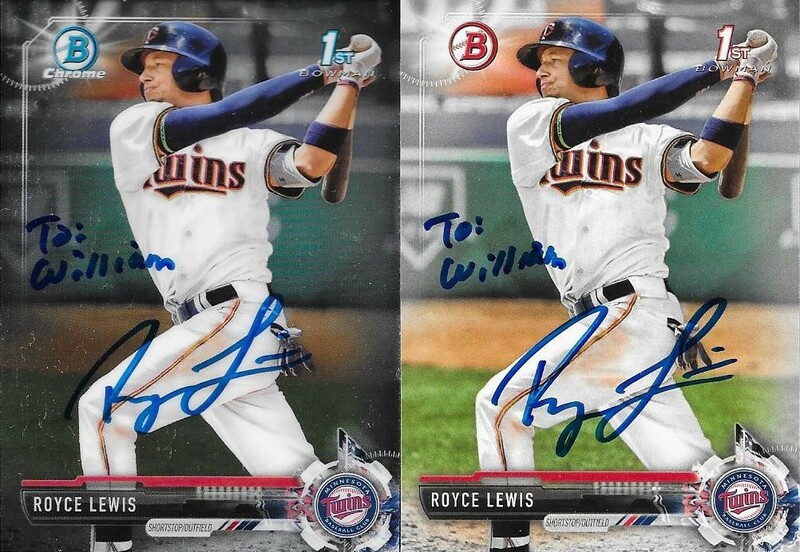 I mailed to Lewis on January 12 and got the cards back on January 29, for a 17-day TAT. This TTM success from Jay Howell helped me get another 1987 Topps for the set. I also got this awesome 1992 Topps taken care of, which looks great. I like the horizontal cards, of course, and this one really looks good with the blue Sharpie. The 1987 looks pretty good, as do the 1988 and 1991 that I got signed. Howell (b. 1955) played in the majors from 1980 to 1994 for the Reds, Cubs, Yankees, A's, Dodgers, Braves and Rangers. He had a career record of 58-53 with 155 saves, 666 strike outs and an ERA of 3.34. He was an All Star in 1985, 1987 and 1989. He won the World Series with the Dodgers in 1988. 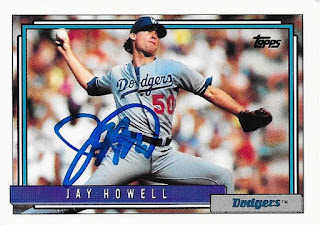 I mailed to Howell on January 22 and got the cards back on January 29, for a 7-day TAT. 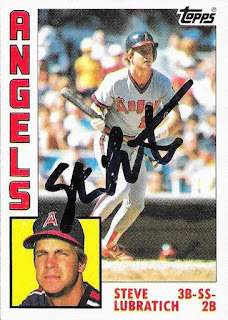 I only had one kind of card for Steve Lubratich, but he signed two of them for me. I found his 1984 Topps in a box of cards I got from the Columbia antique shop last year and finally got around to sending them out not too long ago. The cards turned out really nice. 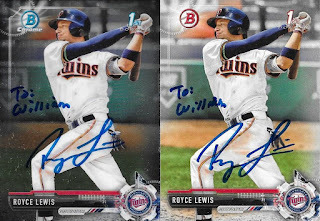 I kept the second card in my extras stack in case I needed an auto to send to someone for trade, especially if that someone was into older Topps autos. If not, I can always include it as a gift for a future trade. Lubratich (b. 1955) played in the majors in 1981 and 1983 for the Angels. He had 37 hits, no home runs and a .209 batting average. I mailed to him on January 6 and got the cards back on January 29, for a 13-day TAT. Here is one of the many TTM successes I received lately that was mainly driven by my need for signed cards in the 1987 Topps set. I was able to cross Bill Dawley off of the list, and the card turned out really well. I also sent him a 1984 Topps, 1985 Topps and a 1988 Topps. They all turned out pretty nice, as well. 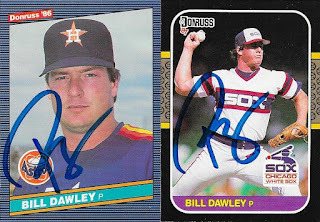 He signs a bunch of cards for folks, so I also added two Donruss cards; a 1986 and a 1987. Dawley (b. 1958) played in the majors from 1983 to 1989 for the Astros, White Sox, Cardinals, Phillies and A's. He had a career record of 27-30 with 292 strike outs and an ERA of 3.42. He was an All Star in 1983. I mailed to Dawley on January 18 and got the cards back on January 29, for an 11-day TAT. Christmas Gift From Jackson T.